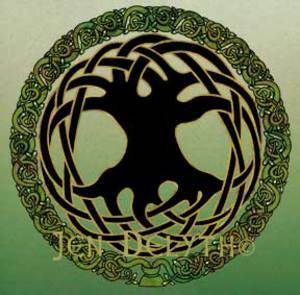 The Celtic Folk-Soul dances with unique rhythm and cadence in our culture today. There is an intricate wit and joy that playfully acknowledges as part of the natural cycle, the darkest aspects of a difficult life of challenge and hardship. As we continue to explore our connection to the world and to find anchor within the sometimes strange sea of human existence, the voice of the Folk-Soul gives direction and insight. As a living memory, this interchange of ideas explores the mysticism of the trees, the waters, the air that we breathe – and all that lies in-between. This is a creative and vital energy that has crossed the oceans with her people and continues to thrive in the new places, as in the old. This is a living tradition with ancient roots reaching back to the first people. 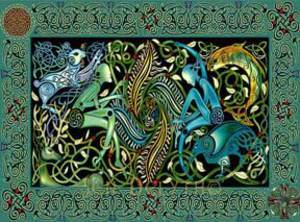 As a fluid and yet strongly characteristic style, Celtic art continues to change and develop – most important to those who continue to adapt and keep the tradition alive. Elements of the traditions of those who lived in comparative balance with their environment may infuse us with their perspective and insight.